To support my theory that visual narrative had to move from the limited space of lintels to the larger and looser space of pediment I had to look in detail to the latter in conjunction with temple architecture. This has brought me imagine a classification of pediments, which I do not use here for simplicity. We are living in a world dominated by images. Humans always felt the need to invent images of supernatural being that could help them in their desired tasks; then images were invented of gods to venerate, subject to rituals, particularly in in India. 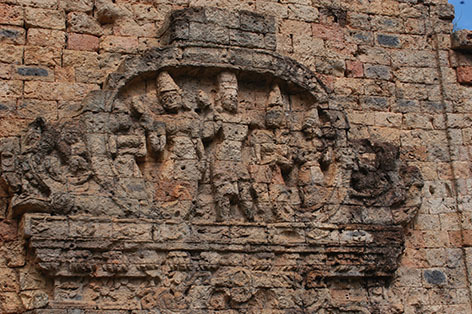 The first examples of visual storytelling are enlightening architectural elements of many Indian temples (Barhut, Sanchi, Ellora, Amaravati, etc.) 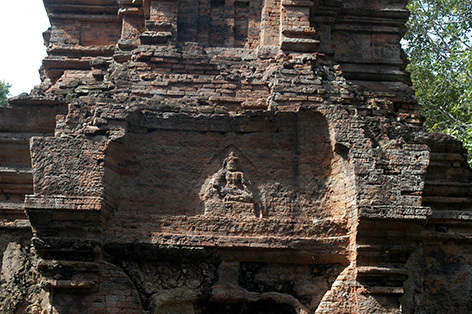 These images had a fundamental role in the development of Indian religions, the echo of which was felt in Cambodia since the 6-7th centuries. In Khmer architecture, temples dedicated to one god or another, the image of a god was situate on medallions along or on an arching ribbon or amongst the vegetal branch decorating a lintel. Exceptionally rare were lintels entirely covered by godly images or of events related to them. 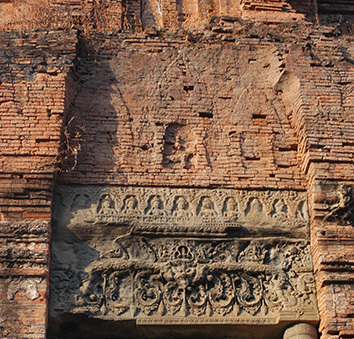 Some lintels of Sambor Prei Kuk’s towers even have narrative stories filling the lintel space (tower S1). 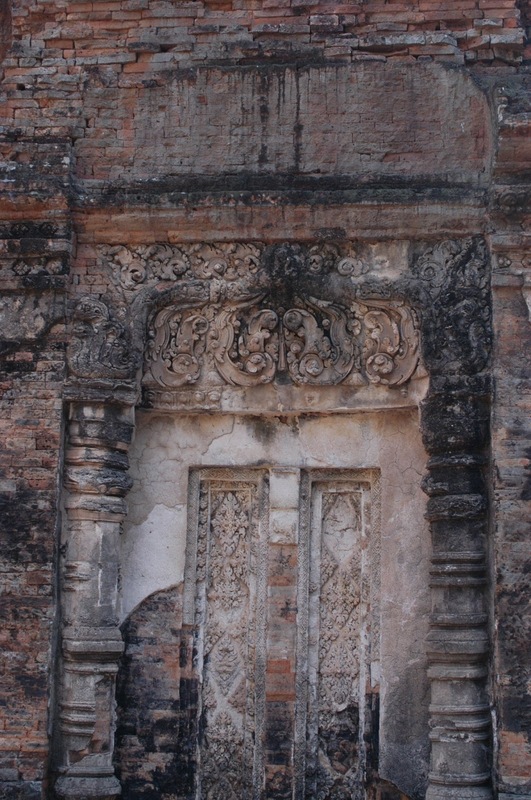 A most educating example is the lintel of Wat Eng Khna (second half of 7th century) where not a single more image would fit the layout. 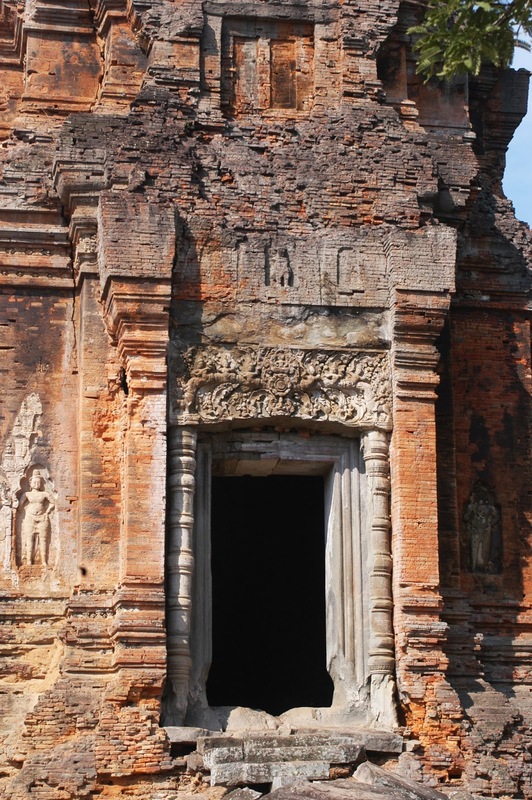 Through scholarly research published by eminent scholars in the last 20 years, it is clear that in Khmer art, the narrative power of the lintel was fading from the 10th century. Lintels had a restricted narrative potential also because their size/format was too small and crowded by pure ornamental elements (vegetal scrolls and pearl’s colliers cascades).The true function of a lintel is of architectural support. A larger space had to be found where the new myths, regularly arriving from India, could be visually narrated. Worshipers relentlessly needed to see better and larger images of the gods they wanted to venerate. It was essential to have images clearly readable from faraway, perceived closer and alive, able to listen to the supplicant. 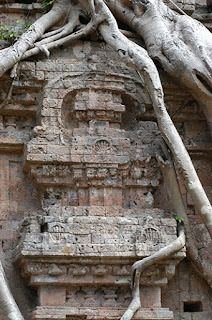 On lintels, the beautiful thick large vegetal branches kept suffocating the small central image (hieratic god). 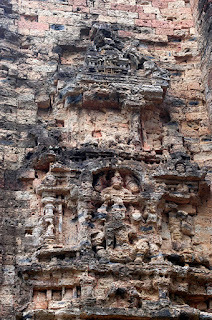 Being larger and of flexible in size, the pediment became more and more the instrument for carrying visual narration, often embodying several key events of a story. 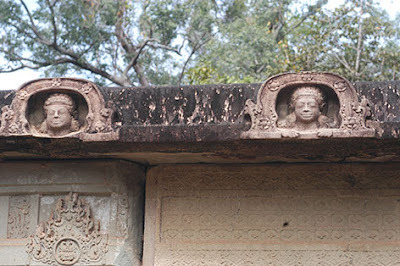 With regard to lintels, examples of classification are perfectly documented in Khmer classical literature, especially the comprehensive works of Madame de Corail Rémusat (1951), P. Stern (1920), and J. Boisselier (1966). 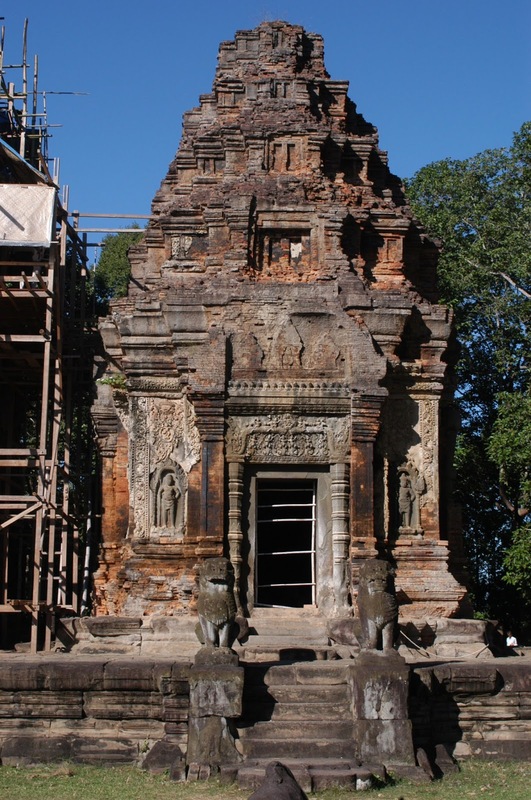 There also is a technical study of lintels and pediments in Khmer art, written in 1990 by René Dupont as an addenda to the book by Claude Jacques on Angkor (Bordas 1990: 171-183). It defines pediment types, from inverted U to triangular and then to polylobate, along a scheme that in part I share. Unfortunately, his professional engineer study was entangled with the notion and classification of “styles”. Inverted-U pediments disappeared when brick construction was abandoned in favour of sandstone (different types of sandstone/arenaria). 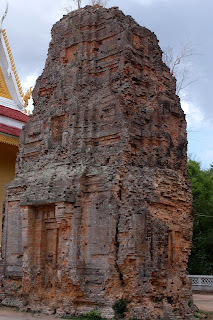 With the increasing power of the King, temples were built in hard stones with many sections in wood. 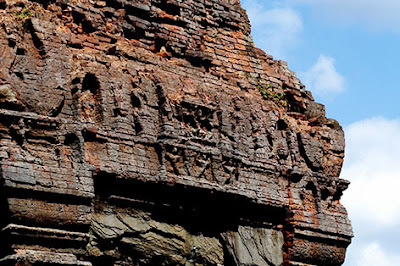 Even when the basic structure was in laterite, the surface was always embellished with stone panels and lintels. To explain my view on the evolution of lintels and the development of pediments, I prefer to attach a large number of explicatory photographs, rather than lengthy written discussions. After having studied the evolution of lintels of Khmer temples following the magisterial work of Jean Boisselier (1966:155) I developed my theory on the birth of pediments. 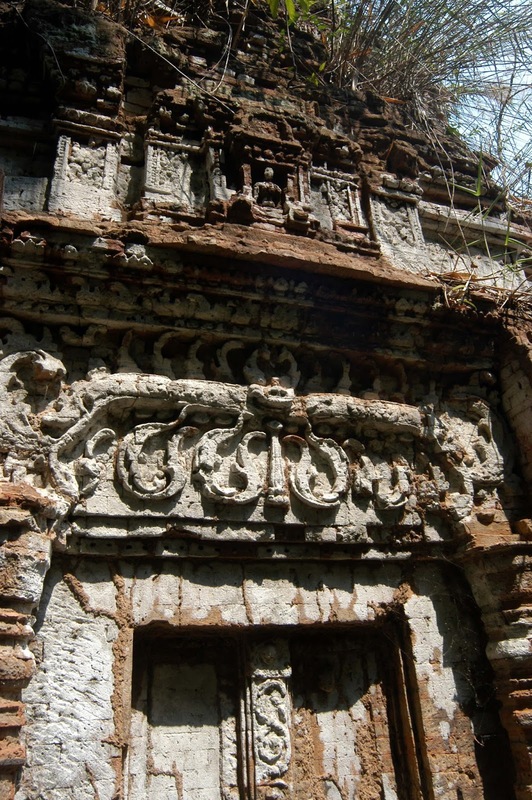 Before the 9th century, lintels were usually carved with thick curved band carrying medallions of gods or saints; then a lot of accessories took over the space filling the lintel with scrolls of flowers and cascades of pearls and playing nagas. In my paper Archaeology of images No.22 we will see how pediments become rapidly of narrative type. The easily visible function of narrative had its potential increased with larger images on the wider space of the pediment, relegating the lintel to a pure functional element. I like to say that narrative “migrated” from lintels to pediments. 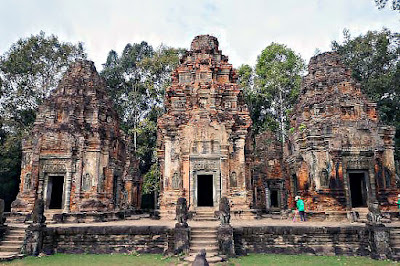 The effect was exhilarating especially when visual narratives pediments were added to the temple’s entrance gates or to the temple towers, in particular to the temple’s central one, as at Angkor Wat. 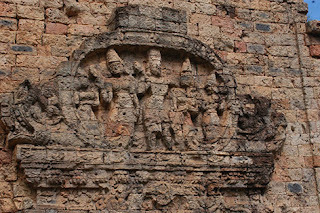 Pediments become the best tool for broadcasting visually the meaning and symbolism of narrative scenes. 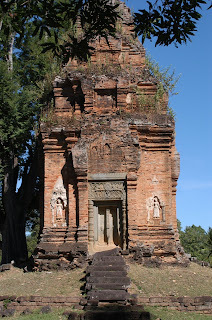 Following my theory, it is evident the lintels had too little space for developing complex narrative that could be easily readable by the acolytes and to illiterate people that the clergy and the king wanted to be informed. I question if in the progressive trend towards gigantism also in pediments may have not brought some Khmer to consider as pediments also the Baryon’s gigantic faces on the sides of towers. 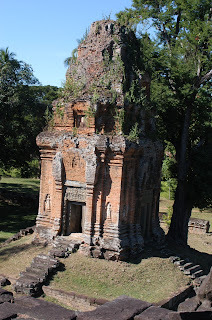 The 8 sanctuary-towers that surround the Bakong pyramid, built in brick, do not have a proper pediment but over the lintel they have a tall niche carved in the bricks of the tower. 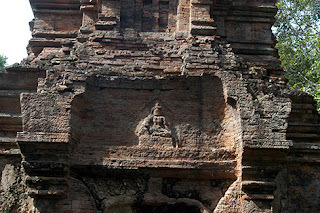 At the centre are silhouettes of images of gods, that later were moulded in plaster. 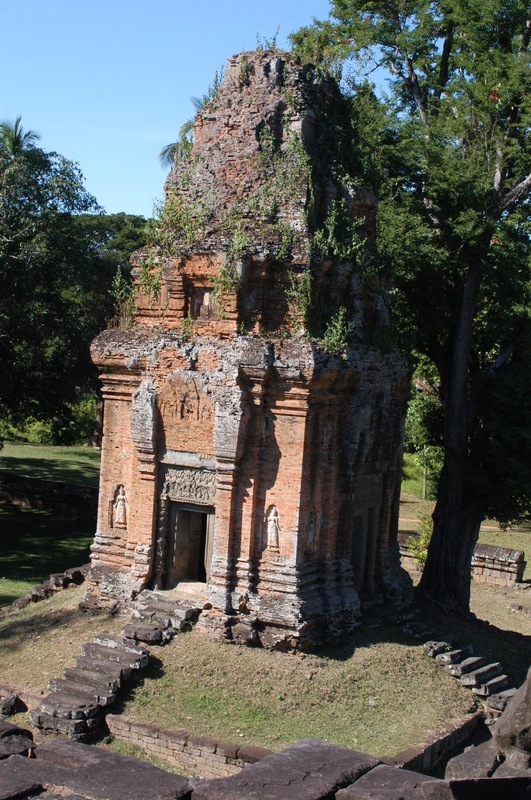 After the examples of Sambor Prei Kuk there is no further evidence of narrative until the Bakong (c.300 years), either due to historical events or to the disappearance of monuments that existed during this time gap. At this stage of my knowledge I do not think possible to determine accurately the age of a temple on the basis of its lintel/pediment layout. 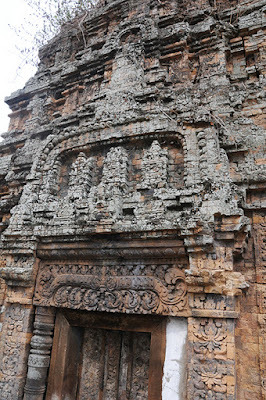 In general, proto-pediment and tabular pediments are the oldest (9th century), but all the other types can overlap in time, be contemporaneous. These layouts’ difference would be secondary to more significant elements (architecture, established chronology) used to date a temple. A progressive linear evolution of carved visual narrative is broken by the extraordinary layout of Banteay Srei at the end of the 10th century. With my study of the evolution of pediments I am attempting a new approach to the development of Khmer culture. 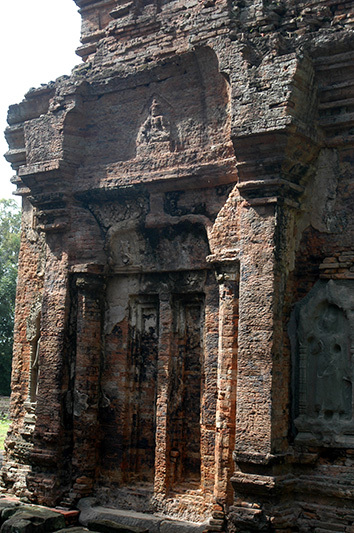 Fig.2 – Sambor Prei kuk. Different types of kudus. It may be the primordial concept of a pedimednt. 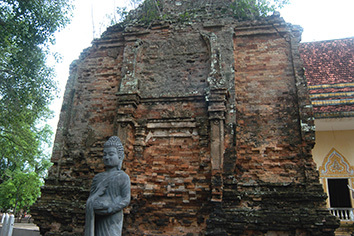 Fig.3 – Sambor Prei kuk. Different types of kudus. It may be the primordial concept of a pedimednt. 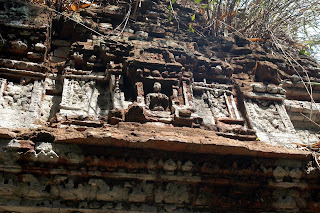 Fig.6 – Hanchei, Kuk Prah That. Shrine with Kudus at each level of the roof. 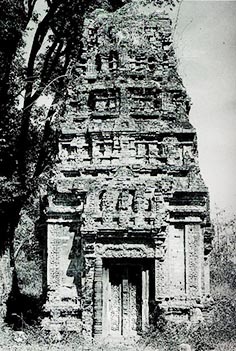 Fig.7a – Phnom Da. 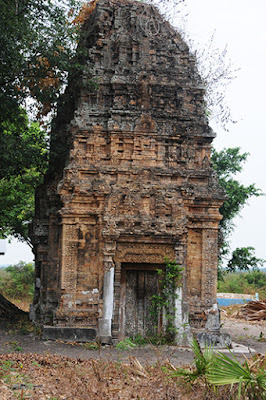 Ashram Maha Rosei. 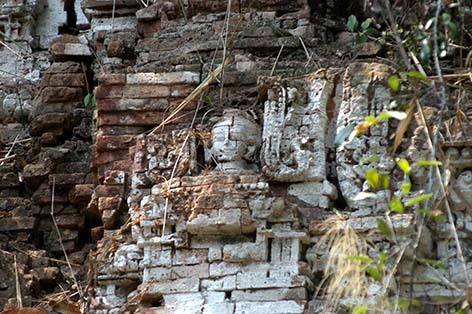 Fig.7b – Phnom Da. Ashram Maha Rosei. Fig.10 and Fig.11 – Sambor Prei Kuk. 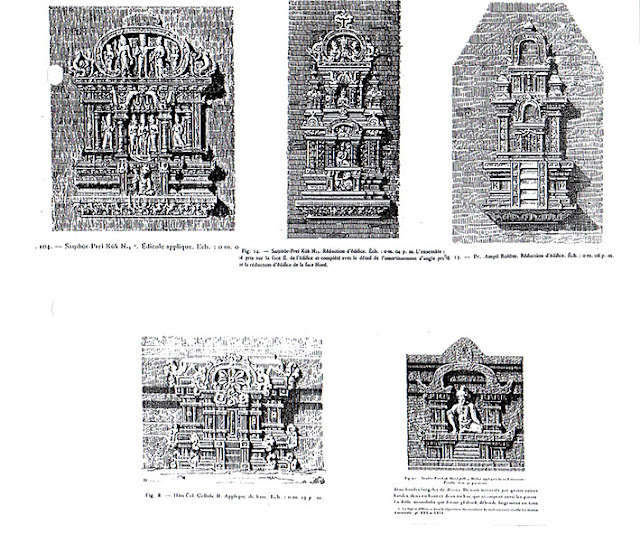 Fig.14 – Drawing from Parmentier 1907 view of different type of palaces of Sambor P.K. Fig.15 and Fig.16 – Trapeang Pong. There are remainders of a rectangular brick’s construction that repeats over each false window of the same tower. No proper pediment. Fig.17 and Fig.18 – Hanchei. 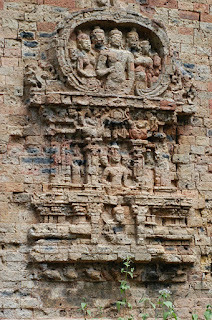 Brick tower with tall inverted U pediment; its decoration is lost except what seems to be some flowers. Fig.18 – Hanchei. 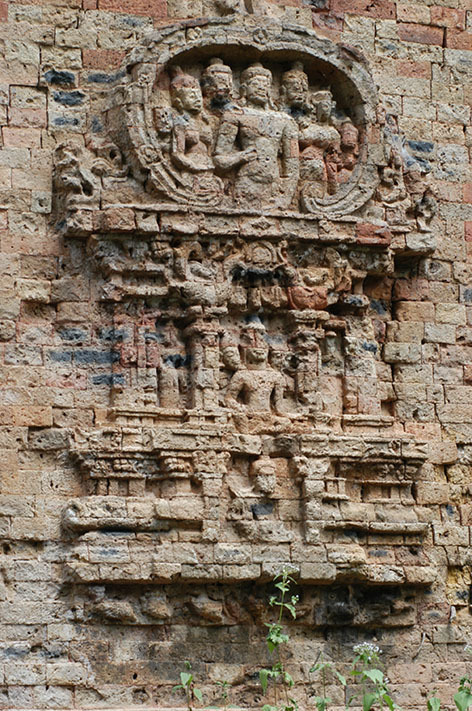 Brick tower with tall inverted U pediment; its decoration is lost except what seems to be some flowers. 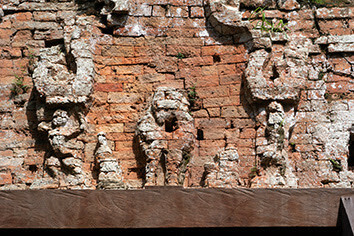 Fig.19,20 and 21 – Prasat kampong Preah. 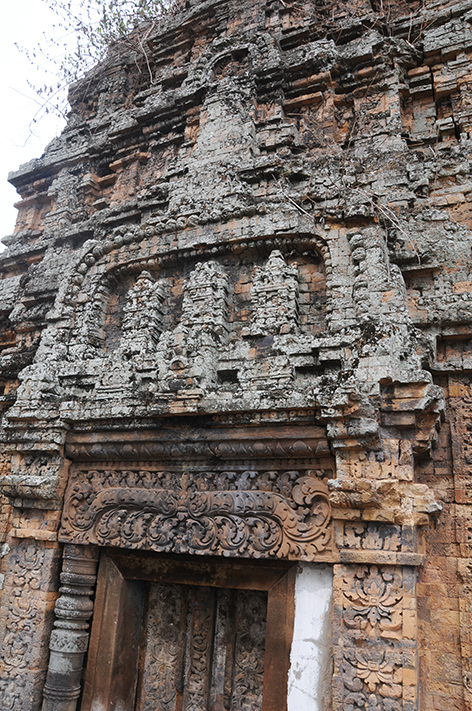 Over the door with sandstone lintels is an inverted-U pediment containing three shrine-towers. 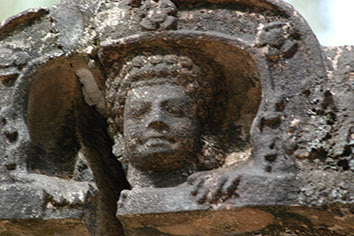 Pediment (derived from an inverted –U) with at the centre a carved image of a god. 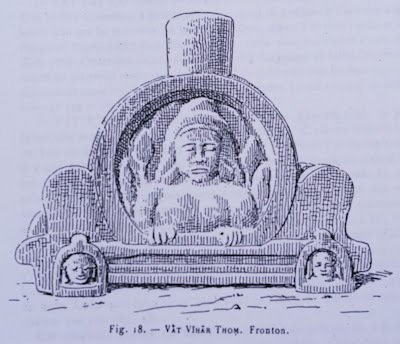 Fig.28 –Lolei. 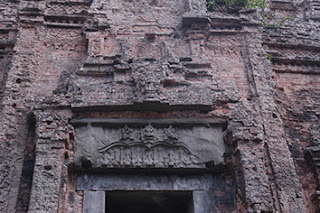 Rectangular space filled by giants or being similar to Garuda. 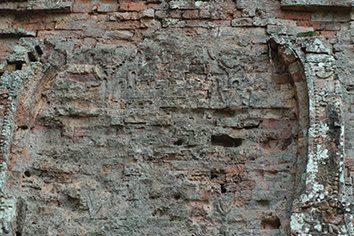 chunk a rock inserted at the top of the lintel. 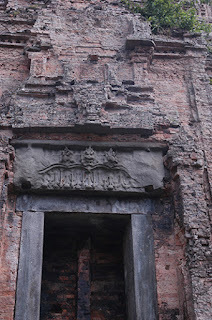 Was-it the first idea of enlarging the lintel? 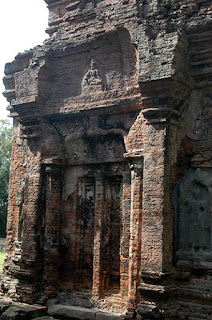 The poor quality of the slabs rock of schistose sandstone did not allow any carving. 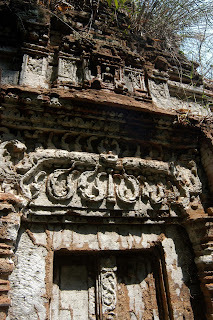 The tabular pediment shows figures, some with wings. Fig.43 and Fig.44 – Prasat Andet. No pediments left. Fig. 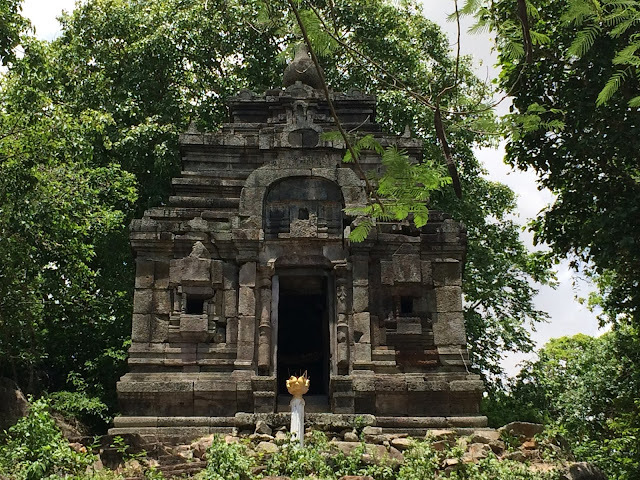 45 and Fig.46 - Prasat Phum Prasat. 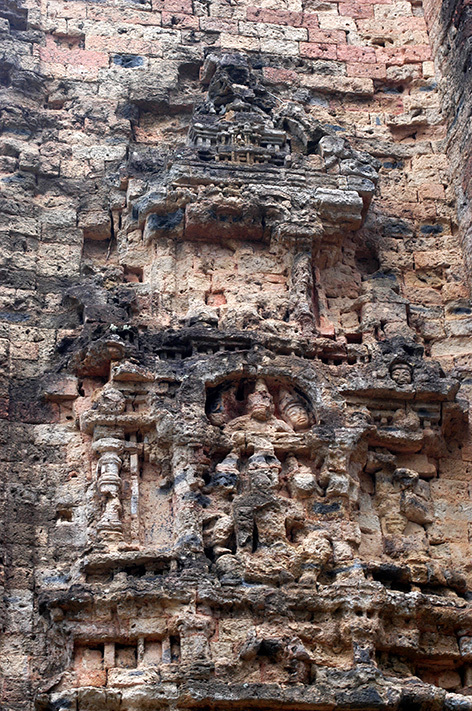 No pediments but a curved terminal of the tower, perhaps with images of some Gods,as in India.